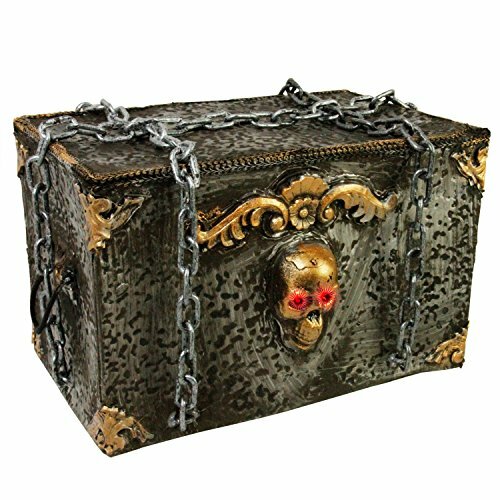 A creepy chained up pirates treasure chest that refuses to give up the ghost, as you hear a ghosts desperate howling phrases coming from within it! This animated touch activated chest will move and roll around on a floor or table, while the ghost within it howls a its eyes light up. The chest has a spooky skull on the front of it, and its eyes light up and strobe back and forth from red to blue while the chest howls. Screams out in howls and moans of agony the speaks the desperate phrase - Who are you? trick or treat!, and then it breaks out into a ghoulish laugh. A creepy chained up pirates treasure chest that refuses to give up the ghost, as you hear a ghosts desperate howling phrases coming from within it! This animated touch activated chest will move and roll around on a floor or table, while the ghost within it howls a its eyes light up. The chest has a spooky skull on the front of it, and its eyes light up and strobe back and forth from red to blue while the chest howls. Screams out in howls and moans of agony the speaks the desperate phrase - Who are you? trick or treat!, and then it breaks out into a ghoulish laugh.